Street for a lift assist. man who had fallen and hit his head. TVEMS assumed patient care. Berthoud Fire from the scene. the homeowner to call if anything changes with the detectors. Berthoud Fire was dispatched to Hwy 60 for a grass fire. completed a mop up operation. BFPD responded to the 100 block of Turner Avenue for a structure fire. They found a fire in the garage and started suppression. The crew entered the residential portion of the home for primary search. Larimer County Sheriff had removed one canine, stating there was a feline resident of the house also. Search crews gave primary all clear of humans in the house. Finding no evidence of extension beyond the garage, the fire was extinguished quickly. Upon completion of the investigation, crews removed damaged contents from garage. An insurance agent arrived and contacted a restoration crew, command was terminated. car seat was installed, and education given to customer. of the patient for transport. the patient for transport to a local hospital. State Patrol Hazmat arrived on scene and the clean up was completed. medical. The crew assisted TVEMS with packaging of the patient for transport. sick person. The crew packaged the patient for transport to a local hospital. Berthoud Engine 26 responded to Larimer Cty 4 and Cty Road 21 for a grass fire. They located a controlled burn at the end of Rotor Way. 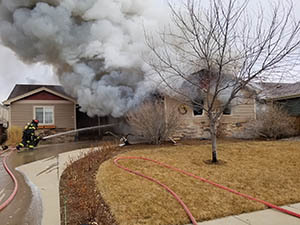 The homeowner stated he did not have a burn permit and agreed to put the fire out. The crew explained to him the process of obtaining a permit. person. TVEMS assumed patient care and cleared Berthoud Fire from the scene. for transport to a local hospital. controlled burn. The fire was brought under control and mop-up was completed. the high detector and then changed all of the other batteries around the home. assisted with the packaging of the patient for transport. care and the patient was walked to the ambulance for transport. with packaging of the patient for transport to a local hospital. Citizen assist with replacing batteries in high ceiling detector on Arapaho Drive. a medical. TVEMS assumed patient care. chirping smoke detector. The crew replaced the battery and reset the system. purchase a new one today and replace it. Citizen assist to install a car seat for an 11-month-old child. sick person. The patient was loaded and transported to a local hospital. Site contents copyright © 2019 Recorder Online	except as noted. All rights reserved. | 85 queries in 2.527 seconds.